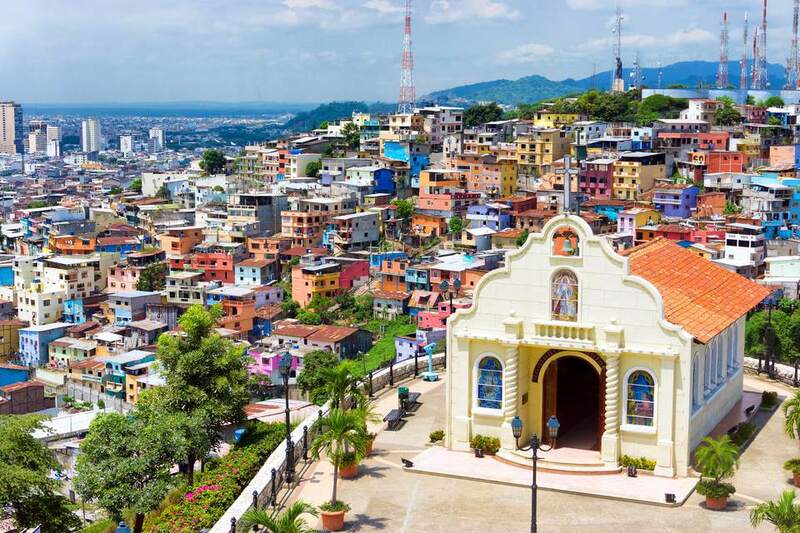 There are many enticing things to do and see in Guayaquil, Ecuador, including a scenic esplanade walk, museums, churches, parks, nature reserves, historic areas, and nearby beaches and resorts. Since the mid-1800s in Guayaquil, this waterside esplanade has been the place where locals and visitors have spent their evenings looking for a cool breeze off the river, strolling along or visiting with each other on benches. On the Malecón is the semicircular monument of La Rotonda honoring the historic meeting of Simón Bolívar and José de San Martín. Original residential area of the city on Santa Ana hill, where restored houses are painted bright colors and visitors stroll cobblestoned streets. Calle Numa Pompilio Liona has stairs to the Plaza Colon, where cannons overlooking the river are a reminder of earlier defenses against pirates. Located in the center of the city, the Museo Municipal, Museo Nahim Isaias, archaeological museums and the anthropological museums are worth visiting. Guayaquil Historical Park is a great way to spend a really touristy day getting to know some of the city's history and a little of the coastal region's culture. The park is separated into three main sections: The Wildlife Zone, The Urban Architectural Zone, and The Traditions Zone. Parque Bolivar is also known as Iguana Park for the large iguanas who like to rest on tree branches. The city's largest park, Parque Centenario, is a showcase for many monuments, including the one to patriotism. The modern cathedral and the impressive San Francisco, restored after a devastating fire in 1896, invite visits. The white and gold Santo Domingo, also known as the Church of Saint Vincent, was the first church of the city built in 1548. It too has been reconstructed due to earlier fires. Flights and cruises to the Galapagos used to be the main reason visitors went to Guayaquil. They still do, but the city's major renewal and beautification efforts invite them to linger. Orchids, water, fountains and thousands of plants offer a welcome respite. From Guayaquil, the Sun Route takes you to great beaches at Playas, Salinas, Punta Blanca, Montañita, Ayampe, Ayangue, Olon, Puerto López and others. Despite being bordered by Guayaquil’s almost three million inhabitants, the protected forest harbors populations of jaguar, ocelot, agouti, peccary, and other mammal species. Cerro Blanco is a great day-trip outside the city of Guayaquil. Easily accessible by bus, visitors can take advantage of a self-guided tour along their two self-guided trails or request a trained guide for a more educational experience. Discover Guayaquil! Take a tour of the city which will take you to see all the must-see places as well as some amazing surrounding scenery, tropical plants, wildlife and much, much more. Get away from the city and take a tour to Salinas beach where you can choose to relax all day or something a little more active—fish! See some amazing scenery and interesting wildlife, including the stunning Pink Flamingo.